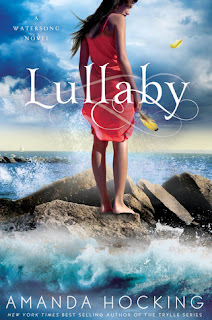 Lullaby was a pretty quick, mediocre read for me. I don't know if it's because of the other books I've been reading that made this book just ok in comparison, but it just didn't keep me interested for very long. Some parts were better than others, but it was pretty slow up until the very end when there's actually something going on. Otherwise I feel like there could have been a lot more that happened, a lot of it felt like everything was over-described just so there were words on the pages so they weren't blank. There was a lot more Daniel in this book, which I really liked. He's the character that most grabbed and kept my attention, the others were just...meh. Once again, the book is written from both Gemma and Harper's points of view. While I was reading it, it was a bit tricky sometimes to tell which one was actually telling the story, since it's written in third person and sometimes they'd both be in the same scene. There were definitely parts I liked, like the very end and a few parts in between. Overall it's a good book, especially since it's about mermaids and boys and whatnot, I just hope the next book is more action-packed and interesting. I haven't read this series yet but I got like 5 copies of the first so is that a sign I should read it already? haha. Too bad it wasn't that great though I often have that problem with sequels.